Guest blogger, Charlene Lyon, continues on her journey to making Eric Wiliams's delicious SOFRITO GREEN BEANS. This is part 2 of her series on this recipe. 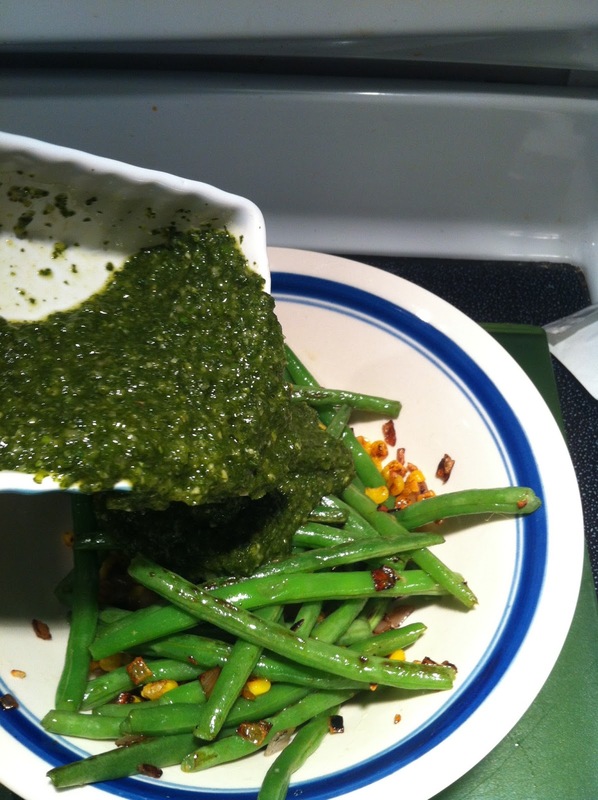 The green beans part of this recipe was super-fast to make. 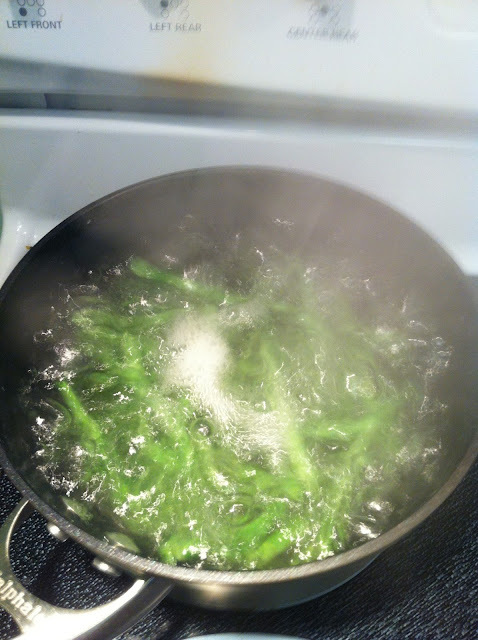 They only require a few minutes in lightly salted boiling water, then just a few minutes in a saute pan. 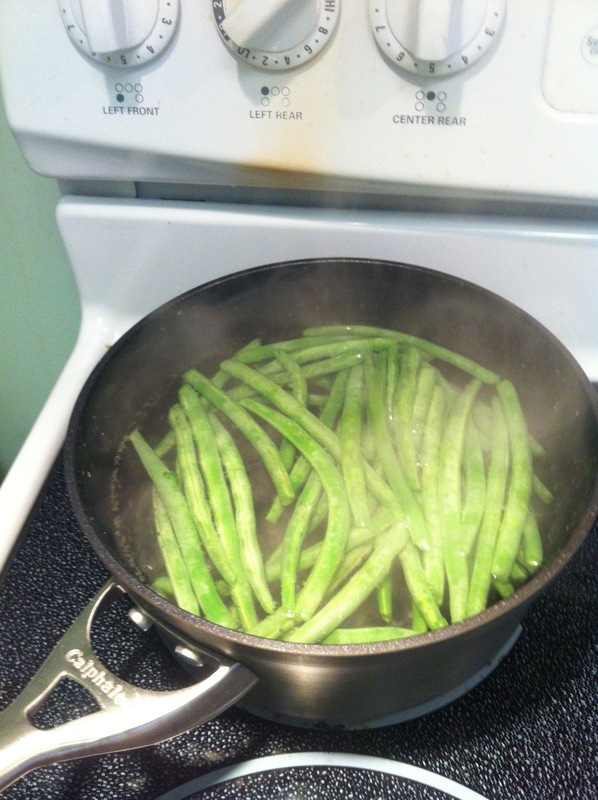 Having blanched green beans in the past, I knew it was best to have them at room temperature as you add them to the boiling water. If they are too cold, they may cool the water down so that you have to wait longer for it to boil back (and you may never get that slightly-tender-but-crisp-in-the-middle texture you need for the next step). You certainly don't want them too soggy at the end. Room-temperature beans only slow down the boil for about a minute, then it gets rolling again soon after. The ice bath is another key to prevent the sogginess factor. If you're going through all of these steps, you probably don't want a texture you could instantly get by opening a can. The bowl I used may have been too small. 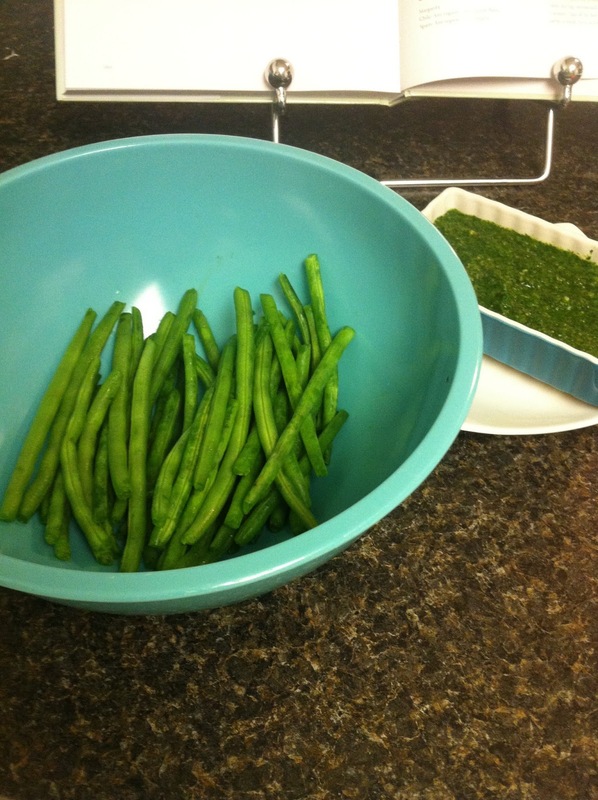 I tossed them in the bath for about 15 seconds, then let them sit for another 30 seconds until the beans felt cold. 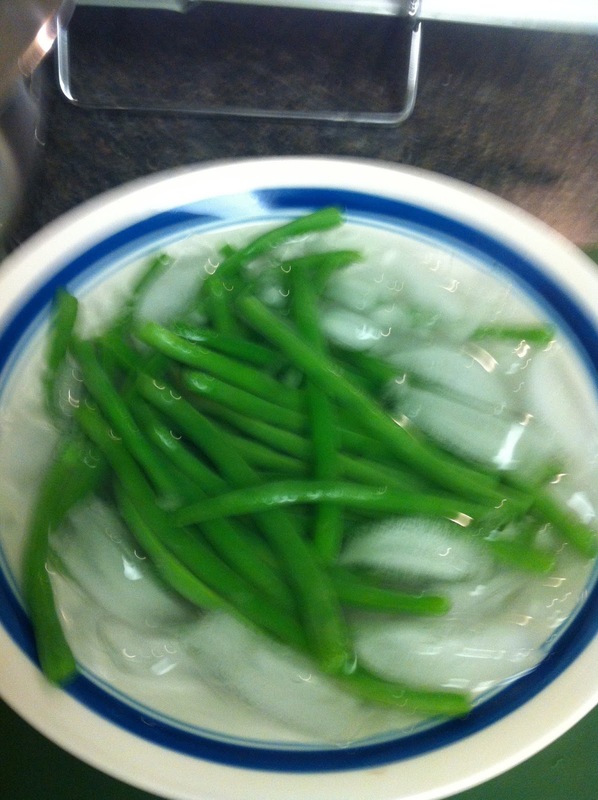 After that, I quickly strained and discarded the ice cubes. Too much exposure to ice and water may be another soggy risk. 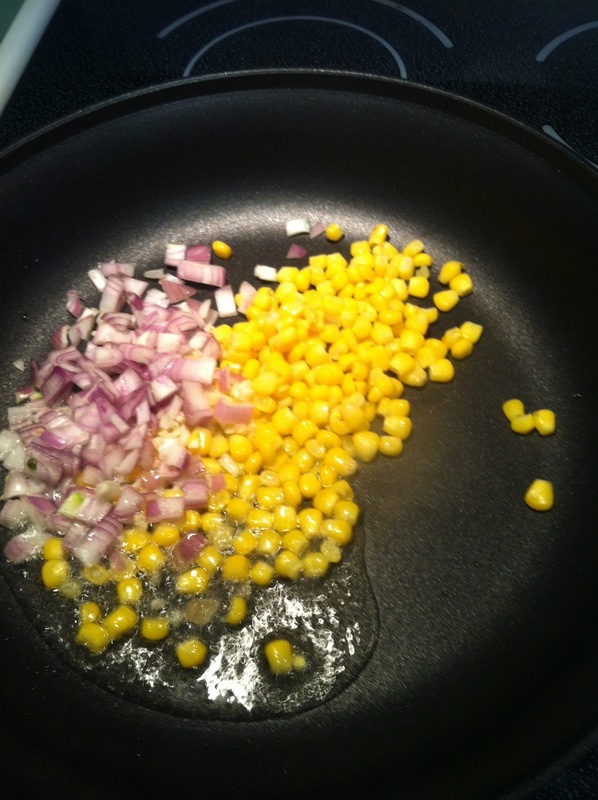 This dish tasted so good with the packaged corn that I think it puts a fresh twist on frozen or imported vegetables some of us have to endure in the colder months. I can only imagine how stellar this would taste with locally grown produce in season. 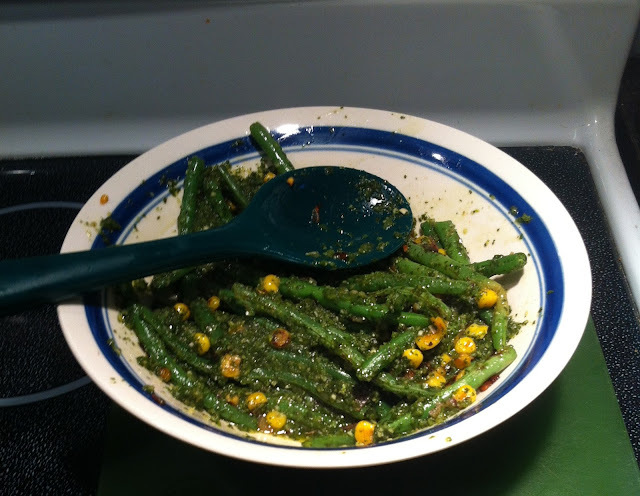 I can't wait to try it this summer, maybe even making this dish in an outdoor saute pan on the grill! I'm not quite sure what to think of the size I diced the shallot for this first attempt. As I began to saute and wait for the beans to brown a bit, I feared that I may have diced it too small. The tiny bits were shrinking and thinking about caramelizing. I didn't want them to get too brown or burnt, so I turned down the heat to about 6 (medium) from a 10. Plus, I feared I was going to miss out on the pleasure of biting into a tender-but-firm, warm, and mellow shallot nugget. I think I'll dice one half of the shallot fine and the other a bit larger next time to see if there's a difference in taste or texture. Plus, I may have used too much oil. I have non-stick pans, so I used only half the oil, which still may have been too much. I noticed that the corn and beans that didn't touch the oil browned almost instantly on one side. I'm just guessing that all of the oil will be necessary if one is using a stainless steel saute pan, which may also provide more browning if that is your desire. If one has a non-stick pan and wants better browning or lower fat and calories, perhaps just a few drops of oil will do. If you have a non-stick pan and think you used too much oil for a desired browning, try to lay the beans flat in the pan for one or two of the few minutes. I then transferred the hot mixture to a bowl and added the rockin' sofrito. There are so many elements my husband and I love about this recipe. First of all, the taste is simply fantastic. It's mellow with just a hint of heat and tang when everything is mixed together. 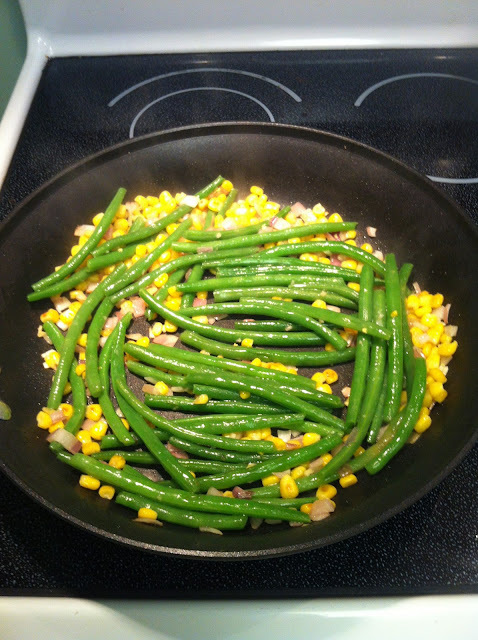 Some of the beans and corn had a nice browned, extra sweet taste. 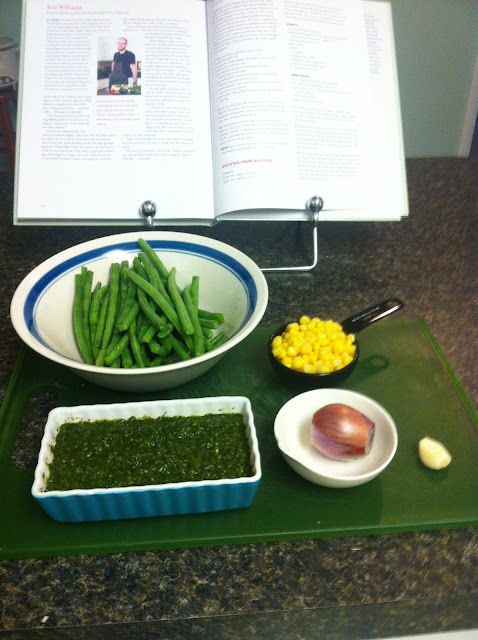 If you follow the cooking steps for the beans correctly, they should be tender, savory, but still have a fresh firmness. 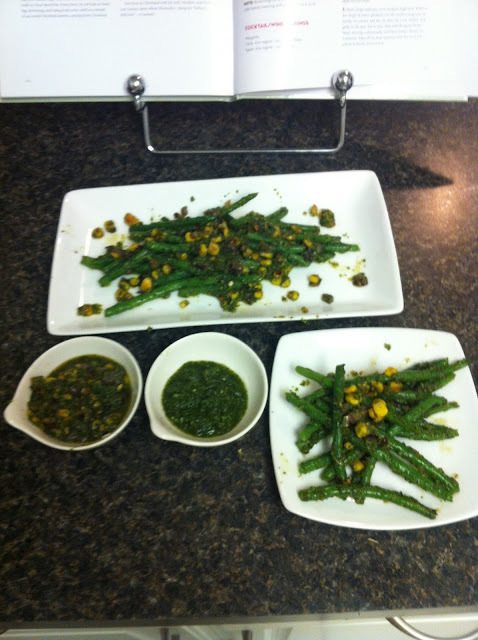 We love that this healthy dish is vegan and super low-cal. We now have something fabulous for our next dinner party for our vegetarian and vegan friends.The sofrito recipe requires no oil and the calorie-conscious who have non-stick pans could do this easily with little added fat. It's so good, I can see veggies, vegans, and dieters making this for an indulgent snack instead of dry popcorn. Also, with all of these attributes, this may be the 'safest,' tastiest and most welcome addition to a friend's potluck. Plus, if your kids aren't afraid of a little kick, I'm guessing this low-cost and quick recipe may introduce them to the magic of vegetables. I made a nice brunch the next day with the leftover sauce. I spread the cooked sauce onto a tortilla, sprinkled on some cheese, and warmed it in the microwave for a few seconds just until the cheese melted. I fried an egg, set it atop the quesadilla, and topped it with a bit of the fresh sauce. If there were any of the beans left, I would have added them too.